Serve up your next red snapper like they do in Chile—cancato-style—grilled whole and served with homemade chorizo-tomato salsa. Score fish on both sides with shallow cross-cuts; place on large sheet of nonstick foil. Coarsely chop 6 garlic cloves; place inside fish cavity. Chop remaining garlic. Blend half of the remaining chopped garlic and 1/3 cup steak sauce in blender until smooth. Add 1 cup parsley; blend until smooth. Spread prepared sauce evenly on both sides of fish. Place fish (still on sheet of foil) on grate of grill; cover with lid. Grill 25 to 30 min. or until fish flakes easily with fork, turning after 15 min. Meanwhile, cook chorizo in medium skillet on medium heat 5 min. or until done, stirring occasionally. Remove chorizo from skillet, drain. Add remaining chopped garlic to skillet; cook and stir 1 min. Stir in tomatoes; cook 3 min., stirring occasionally. Return chorizo to skillet. Add remaining steak sauce and parsley; mix well. Transfer fish to serving plate; top with the chorizo mixture and cheese. The name "cancato" comes from the indigenous Indian word for grilling. 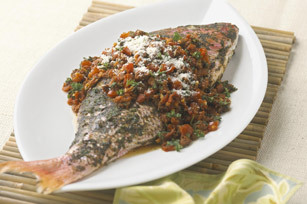 In Chile, this recipe is typically prepared with a whole fish that is opened like a book, topped with the chorizo, cheese and garlic mixture, then grilled flat. If you don't have nonstick foil, you can use regular heavy-duty foil instead. Just spray with cooking spray or brush lightly with canola or vegetable oil before using as directed.